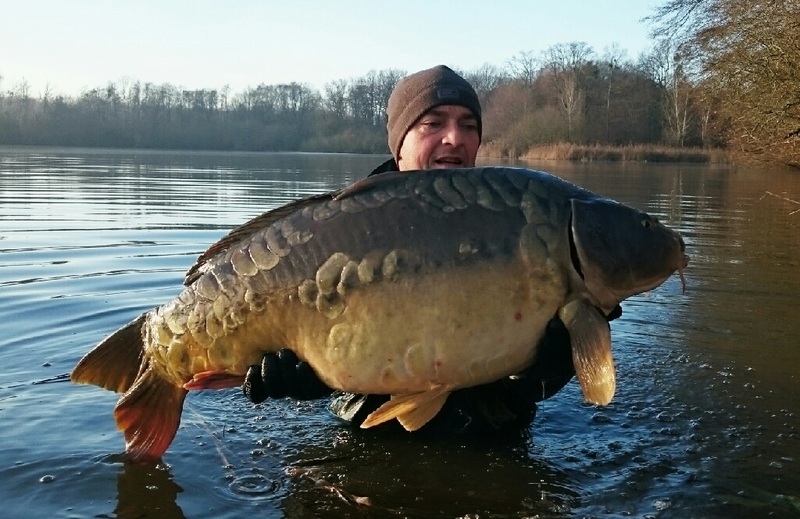 "The lake has a good stock of smaller fish and a smattering of 30+lb lumps. A few snags around the margins and weed patches developing so surveying the lake is essential. Facilities are basic, as described but not maintained so take cleaning stuff with you and don't expect hot showers or clean toilets. Sweet bright pop up boilies fished over a bed of pellets do the trick but the smaller fish do come in." "Far from a good weeks fishing, possibly the weather played a part, low oxygen levels, due to falling leaves and green algea, but the fish weren't really feeding. 5 carp out to 5 anglers all week. I got off to a good start on the first morning landing a 45lb common carp and was hoping this was a sign of things to come, but unfortunately that was my only carp out all week, I did loose one to a hook pull on the last night. 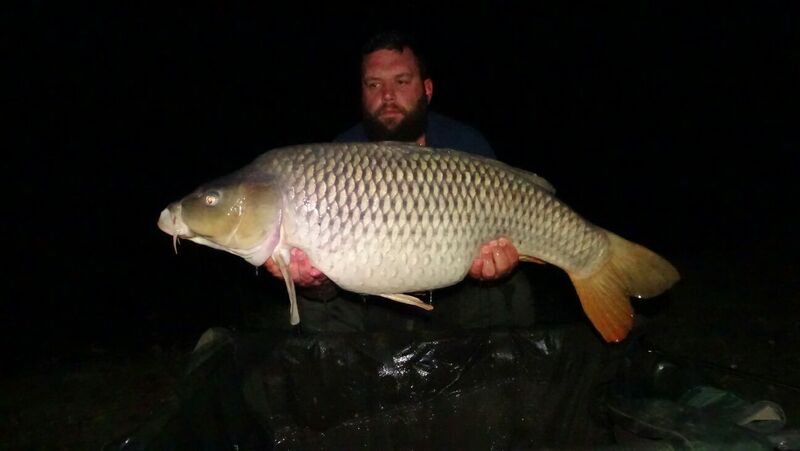 My friend had two carp during the week, again both commons, 24 & 34lb. The three fish we had were in fantastic condition. The lake itself is lovely, set in woodland. We fished swim 1 which has a large wooden cabin which was fantastic for storage , cooking and socialising. We even slept under it on the last night after packing our bivvys away dry as if was forecast to rain on the Saturday morning, which it did. The amenities block was good, it was clean, and the showered despite being solar heated water was always hot. Basic, but sufficient. Although we didn't have a particularly good weeks fishing, I would return, perhaps at a different time of year as I feel I have unfinished business with the residents of the lake." La Renarde is in the Aube (Champagne) region of France, around 252 miles (407km) from Calais which is about a 3hr 45minute drive from Calais. The journey down is easy to follow over mainly motorway-standard roads. The nearest main town is Brienne Le Chateau which is close to the majestic Orient lake and forest. The town has everything you will need during your stay including shops, restaurants and bars. There is also a small tackle shop. The lake has a large stock of carp so can be classed as relatively easy although the lake does have fish to around 55-60lb. 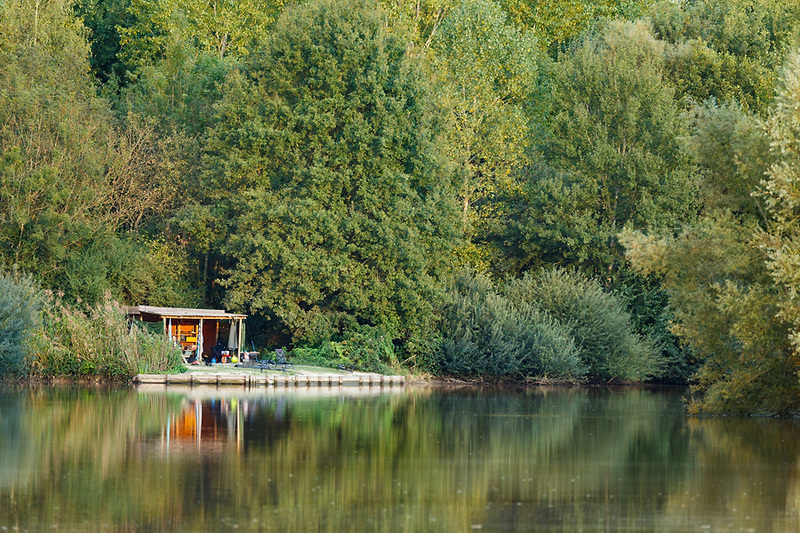 It’s a popular venue, and rightly so as, with excellent fishing, the basic requirements as far as facilities, and peace and quiet, it’s got something for everyone. La Renarde has a surface area of around 10 ha (24.7 acres). It is around 2m deep and features a bottom comprising mainly clay with silt areas. There are no major snags and the water does not suffer from weed problems. The lake is set in a sylvan setting, in the middle of fields and surrounded by mature deciduous woodland, mainly oak. It is fringed by reeds and has a gravel track around its edge. There are only four swims on La Renarde, which can be fished by a maximum of eight anglers. All the swims are roomy and comfortable and have good access by car. Swim 4 is the one to choose if you don’t like sitting in the sun all day. 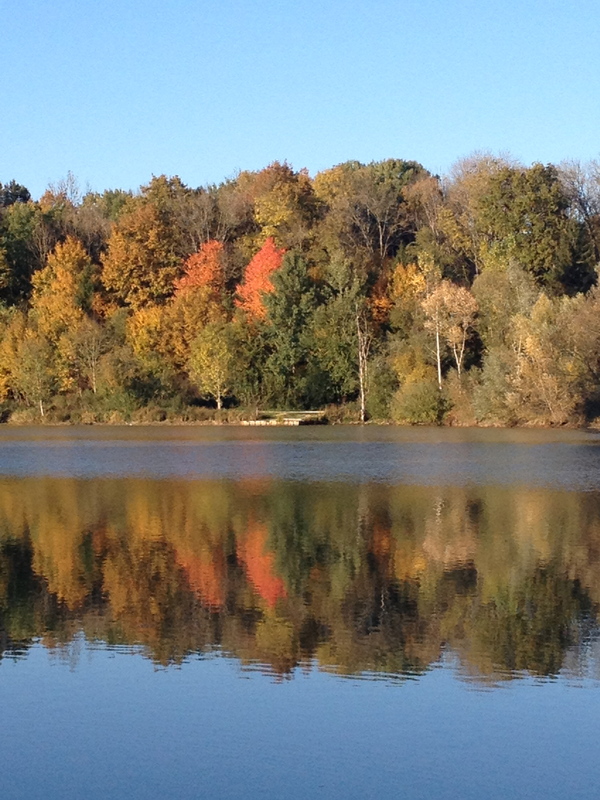 It’s on the south side of the lake and has shaded areas which keep the sun off in the afternoon. The other swims do have shaded areas though and there are some wooden shelters available for use by anglers. Each swim is generally booked for two anglers although a single angler can book a swim (except for swims 1 and 5). The lake fishes well all year round and, as bait boats are allowed, baiting up to entice the fish to feed can be done easily. Don’t worry if you don’t have a bait boat though as baiting up by hand, throwing stick or with a spod will still bring excellent results as the fish like to home in on beds of bait. Long range casting is not required. The margins of the lake shouldn’t be disregarded as there are reeds and overhanging bushes but, in general, this is a lake fished to spots in open water. 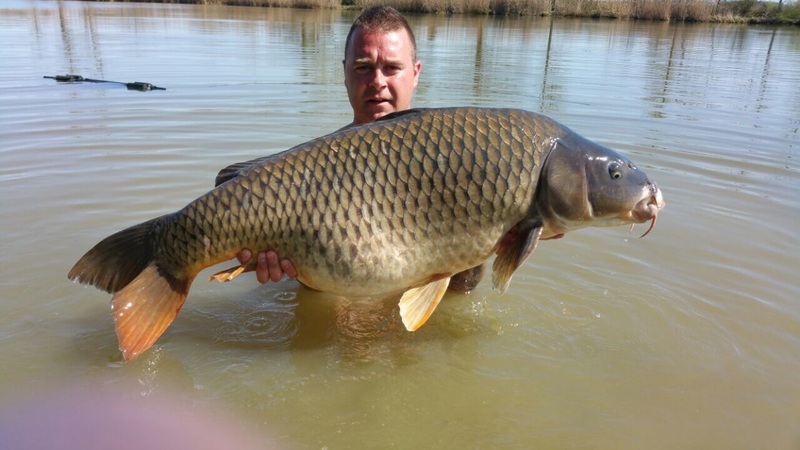 There are around 280 carp in La Renarde ranging from around 20lb upwards with a maximum size of 55-60lb. The water is quite heavily coloured which shows how well the fish feed and multiple catches are frequent. The fish in La Renarde are really lovely with golden commons and plated mirrors. The fish do show themselves well when feeding over the silty bottom and feeding to the bubbling fish will, very often, bring good results. In 2017 a restocking has been done of 30 lovely new carp. There are only four swims on La Renarde, all of which are doubles. 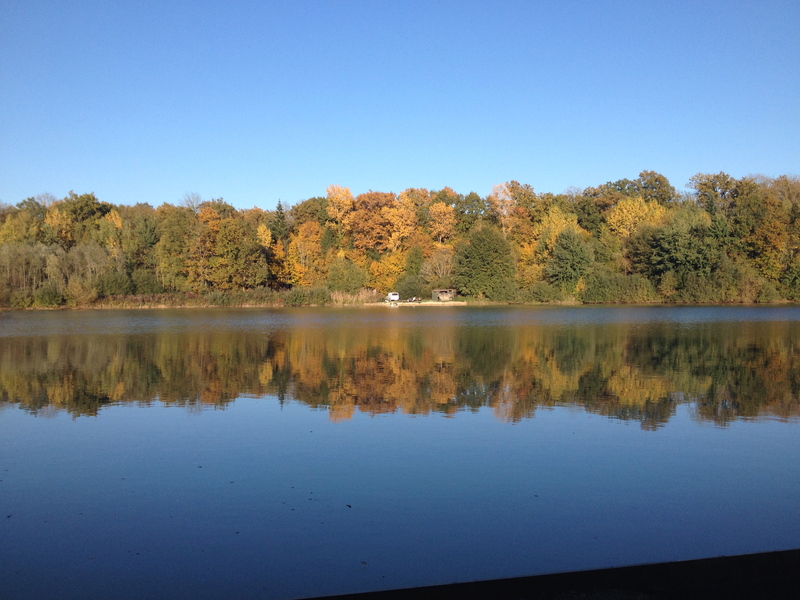 The lake can be fished by up to 8 anglers and can be booked exclusively for groups. Each swim has excellent access by car and the swims are particularly roomy, gravel based and there are also some wooden shelters which are ideal for storing gear or sitting under to enjoy the shade. Swim 1 is on the dam and commands a large area of open water. Swims 3 and 5 are on the north side so make the most of the sun throughout the day. Swim 4 is on the south side and is the one to pick if you like a bit of shade in the afternoon. The lake has recently-built facilities which include a wooden sanitary block with running water and electricity. This is powered by solar panels and houses a sun-powered boiler. There is also a toilet near swim 5. There is good vehicular access to all the swims and the lake is surrounded by a gravel path/track. The lake is only a short drive from the road so is easily accessible in all weathers. Minimum 2 anglers per week. 3 rods per angler, barbless hooks, big unhooking mat, large weigh sling, green tents, no braided mainline, no carp sacks, bait boats are allowed, domestic animals are allowed. · Unhooking mat, min size 30” x 38” (70 cm x 90 cm) and at least 1.5” (4 cm) thick with padded shoulders. Please have a container filled with lake-water to hand for pre-wetting the mat to minimise stress and damage to the fish. · Chest Waders: Chest Waders are allowed. Hooklinks should be weaker then the main line. peanuts, uncooked or not entirely cooked particles. These have to be cooked or weakened until the core is soft. · Please respect the tranquillity and the beauty of the nature. Garbagebags (no bottles) must be placed in the containers on the truck parking place in the centre of the village Juzanvigny. The glass-container is next to the garbage-container. Don't leave any fishing gear there. · The cars can be parked behind the swims. · Dogs are allowed, camp fires are not allowed. Barbecues are allowed.